Seville (Spain) – April 11, 2019 (travelindex.com) – H.E. María Reyes Maroto Illera, Minister of Tourism, Government of Spain, has been awarded a World Travel & Tourism Council (WTTC) Global Champion Award for her country’s work on promoting innovation and technology in tourism. 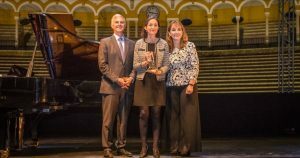 The award was given by Gloria Guevara, President & CEO, WTTC, and Chris Nassetta, CEO, Hilton & Chairman, WTTC, in front of 1,600 Travel & Tourism leaders at the 2019 Global Summit in Seville, Spain, the most important event in the global Travel & Tourism calendar each year. The event was attended by the Mayor Seville, Juan Espadas Cejas, the host of the 2019 WTTC Global Summit, which has attracted people from all over the world to promote the city. This award is unique because it is recognition from the private sector to those officials who support Travel & Tourism and help the private sector to create more jobs and prosperity. The government of Spain, under Minister Reyes Maroto Illera, is providing global leadership by prioritising innovation in the tourism sector. The efforts made by the Sociedad Mercantil Estatal para la Gestión de la Innovación y las Tecnologías Turísticas (SEGITTUR) to promote research and development for innovation and new technologies in the tourism sector have helped to position Spain as a world-class tourism destination and have led to SEGITUR being recognised as an effective model of national leadership and coordination. The result has been the fostering of entrepreneurship, sustainability and competitiveness at the local level through the development and deployment of information technologies to achieve differentiated and highly competitive tourism services. Gloria Guevara, President & CEO, WTTC commented, “The Government of Spain provides a leading example of how the power Travel & Tourism to drive economic growth and job creation. Our sector now contributes one in every seven Euros in the Spanish economy and almost 15% of all employment. This success story has been the result of a concerted tourism development strategy by the Government and the Ministry of Tourism under the leadership of H.E. María Reyes Maroto Illera. Copyright © 2019 Paris Tourisme. All rights reserved. Powered by Travelindex.